CALAR ALTO: Someone has seen the stars and it is possible since the arrival of Vuelta was located at the Calar Alto Astronomical Observatory. 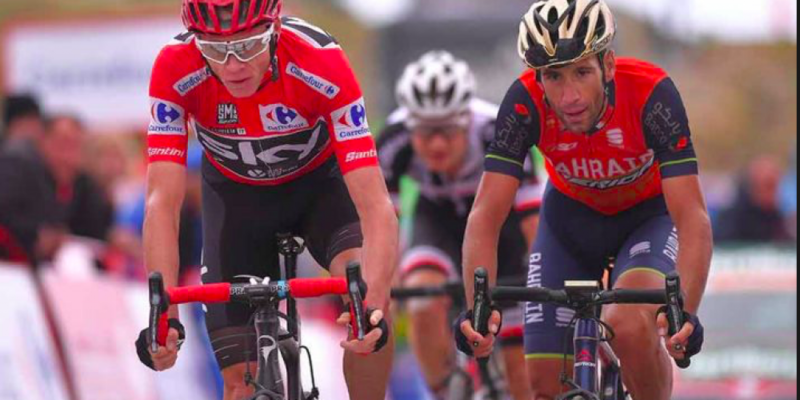 Vincenzo Nibali tries several times to win this race and he gets really close. He miss just one think to complete the perfect day and gap also Chris Froome that in this Vuelta is the man to defeat launched towards a double victory Tour-Vuelta. Nibali has all the potential even though the Iberian race is still long. Nibali attacks, eyes are those of the tiger. He puts all the power needed to create a gap that never rises over a few dozen meters. In Sicilian grimaces we can see all the fatigue and the effort of those who believe in their actions, not a sprint of 33 rpm. He knows that after a high level Giro finished on the podium now everyone is asking him to win: fans, technicians and sponsors. He is determined and trained to achieve this race. He trusts in his ability so he will wait for a moment of difficulty in Team Sky’s robot. Fromey pursues and then hangs up Nibali while the young Colombian Lopez flies to his champion consecration. He win an astronomical stage and allows the Astana to breathe a sigh of relief, and thus prepare in the best possible way the team after Aru defection who only has to formalize its passage in the UAE Team. The classification is now locked and the hierarchies of Vuelta 2017 are better understood and at the moment the struggle for ultimate success has been reduced to 2 riders. Impressed as high-definition names are slowly loose: Yates, Bardet, Van Garden, and also Barguil’s expulsion from his team.